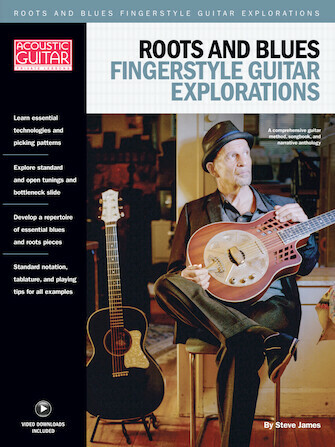 Get to know the nuts and bolts of country-blues and other rootsy styles with this series of in-depth lessons by blues guitar expert Steve James. You'll learn essential chord shapes and picking patterns in standard and open tunings, with and without the bottleneck slide, as well as a wealth of melodic vocabulary. You'll discover how these devices work in a wide range of traditional and blues settings. All examples are provided in standard notation and tablature, with video downloads so that you can see and hear exactly how they're played. Throughout, a wealth of historical information and anecdotes, some of them first-hand, will give you a clear picture of how this music came together. Songs includes: Bull Doze Blues • Crow Jane • Georgia Buck • Green Corn • I've Been All Around the World • Knoxville Blues • Little Hammer • Memphis Rounders Blues • See See Rider • Texas Shorty • Yo Yo Blues • and more.